One of the country’s biggest, and smartest, truckstops is that operated by AW Jenkinson at Penrith. It’s easily accessible from both the northbound and southbound carriageways of the M6 at Junction 40, and is about a three-minute drive from the junction. 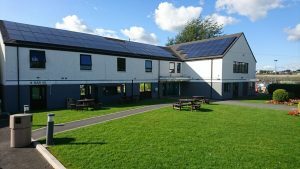 For those on the A66 Stainmore road, the truckstop is a welcome place for a break on this challenging road. The diesel station accepts UK Fuels and Key Fuels cards – but not cash – and there is parking available 24/7. For those drivers wanting a change from yet another night in their cabs then there are motel rooms, providing extra comfort. Opening times are 0600 from Monday through to 1200 Saturday with the fuel and parking areas remaining open 24 hours, seven days a week. There is a 24-hour menu which means whatever time you stop, you can still get a decent meal. 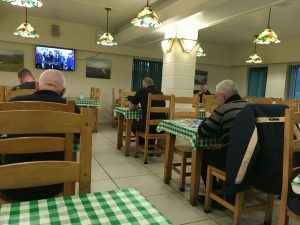 The site has a large restaurant area and offers a range of breakfasts, lunch meals and evening dinners as well as quick bites to eat. Food is cooked on the premises using locally sourced meats and produce with homemade soups and desserts changing on a daily basis. Everyday the truckstop offers a range of different specials on the menu. There is also a comprehensive children’s menu (and even high chairs) if you are lucky enough to have a companion in your cab during any school holidays. Typical meals are rump steak, beef hotpot, turkey steak, mince and dumplings, chicken and mushroom pie and cottage pie. There are also vegetarian options and burgers and grills. There is also a full take away menu for those in a rush. 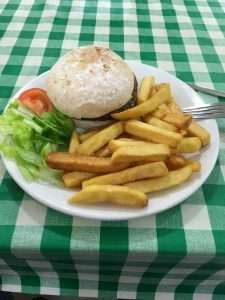 This offers sandwiches, hot and cold, burgers, jacket potatoes, chips and cakes. Prices are very cheap. All food can be eaten in or taken away and can be ordered in advance so that it’s ready to collect when you arrive. The brand new fully refurbished bar offers ciders, beers, lagers and wines, and also serves bar meals. It is open from 1800 to 2300 Monday to Thursday. The large wall mounted TV allows drivers to catch up on the latest news and sport, and a large assortment of games behind the bar, including playing cards and draughts are available. Those parking at Penrith enjoy the peace of mind of a security guard on duty and 24/7 CCTV which means it’s a very safe place to overnight at. There is room for about 200 artics, with a dedicated fridge parking and changeover area. The floodlit site uses a barrier system to offer a simple way of getting in and out. Parking can also be paid for via Snap Accounts. All weekend parking must be paid before 1200 on the Saturday, otherwise payment will be made on account. 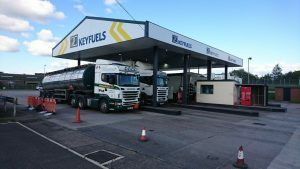 The site has a large forecourt which is fully automated with two terminals operating seven diesel pumps, two AdBlue pumps and two gas oil pumps. 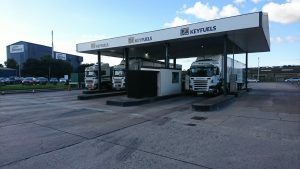 The site accepts both UK (Allied Fuel’s) and Keyfuel’s cards. The site cannot take cash payments for fuel. The forecourt is open 24/7, 365 days of the year and also has both drinks and confectionary vending machines for use when the main building is closed or if drivers don’t have long to stop. There is also a drinking water tap available fto top up water supplies. 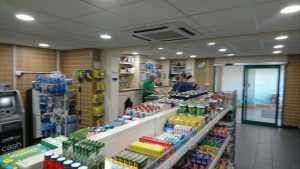 The shop sells clothes, trucking essentials and toiletries. It also has a range of newspapers and magazines. The motel rooms come with a TV, table and a chair. There is a sink with a shaving socket and access to the resident’s shower and toilet blocks is just a few feet away. A single room is £25 per room, per night. For drivers passing through or sleeping in the cab there are state of the art refurbished showers which cost £2, paid for in the shop, where you obtain the shower door key. There are also public toilets and wash basins for use free of charge.